Full-color images by renowned photographers Stephen Strom and Stephen Capra unite with text by prize-winning nature and geography writer Gregory McNamee to document the subtle landscape of 1.2 million acres of remote Chihuahuan Desert grassland in southern New Mexico. Home to many species of wildlife and native plants, Otero Mesa is a place of extraordinary beauty and ecological significance faced with the increasing threat of oil and gas development that has plagued the Rocky Mountain West. This seminal work of meticulous scholarship brings to light the vast beauty of Otero Mesa and its alarming present day reality….A clarion call, Otero Mesa is urgently recommended for all personal, community, and academic library Environmental Studies reference collections and supplemental reading lists. Strom’s and Capra’s photos illustrate the incredible wealth of life and wildness on Otero from thunderstorms during the monsoon season to the intricate geometry of a Parry’s agave. The illustrate the wide-ranging colors and textures of the landscape, giving it a rich depth that might surprise people who look at the stark mesa and think nothing is there. 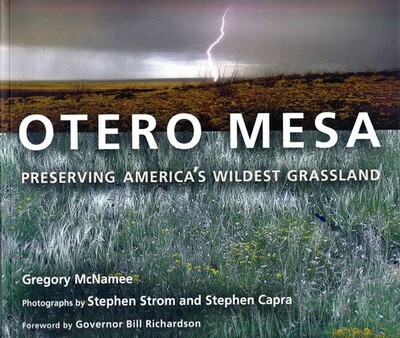 Otero Mesa captures in prose and photos the stark and fragile beauty of this threatened expanse of land and its resident species.
. . . finely written and beautifully photographed . . .
. . . emotional, beautiful, and convincing . . . This beautifully produced publication gives readers an opportunity to see what is at stake in the effort to preserve Otero Mesa’s integrity. McNamee provides a highly personal view of the importance of grasslands in general, and of this grassland in particular, to sustaining a healthy world, and describes the threat posed by oil and gas extraction. Stunning color photographs by Strom and Capra underscore McNamee’s point, showing both the stark grandeur of sweeping landscapes and the delicate beauty of the smallest wildflowers.